I have already made Brussels sprouts soup with cannelli beans a while ago, this is another version that is as good as the other one, just a little greener. I prefer Brussels sprouts in soups than as a side dish, I think their flavor gets smoother and more subtle. It has a velvety and creamy texture, with a nutty flavor from the mushrooms but very delicate. The weather forecast predicted a rainy week and season as a matter of fact and I am getting ready for some winter dishes and brussel sprouts being a winter vegetable, will be occasionally on my table this winter. I know many people are not fond of Brussels sprouts, but I think it’s good to try new ways to prepare things. I like them, I am not crazy for them like I would be for artichokes but I like to make velouté with those cute little round balls. Le Creuset line tends to be a little on the expensive side in the US, it’s not that cheap in France either but still cheaper than here, in my opinion, it’s worth it since those pots last a lifetime. Wash the sprouts, cut the extra stem and remove the hard leaves from the outside. In a large pot, heat olive oil, add onion and brown them. Add thyme and stir for another 5 minutes. Add Brussels sprouts, potatoes and stir again to coat the vegetables with olive oil and onions. Add bouillon and water. For water quantity, I cover the vegetables with about 1 cm water showing above level of vegetables. That is the perfect quantity I use when making velouté. Adjust with salt and pepper. Cook until all the vegetables are cooked. When cooked remove thyme branch, and blend using a blender or a mixer. Serve with a small spoon of creme fraîche and a slice of grilled prosciutto. This entry was posted by silvia on December 7, 2009 at 9:28 pm, and is filed under Soups. Follow any responses to this post through RSS 2.0.You can leave a response or trackback from your own site. I’m a huge Brussels Sprouts fan, they remind me of cabbages only bite size which are adorable to me. I really like all the components of this soup, this is a soup that I can have by the fire relaxing away. i made last night a vegetables soup,but without brussels sprouts…you had a wonderful ideea,i can imagine the taste! This sounds delicious, and is certainly seasonal! I can have this soup even though it is brussel sprouts. I will actually try and make this. I don’t think we’ve ever made a soup where Brussels Sprouts are the main veggie. What a great idea, especially since they’re in my top 5 favorite veggies. Why didn’t we think of this earlier? This soup sounds perfect- hearty enough for the winter chill but aptly balanced. Very well done. I will have to try this soon. mmm, i love all those ingredients – this soup would be a perfect way to unwind and stay toasty on a cold winter day. Great ingredients. I’ve saved this recipe to make soon! 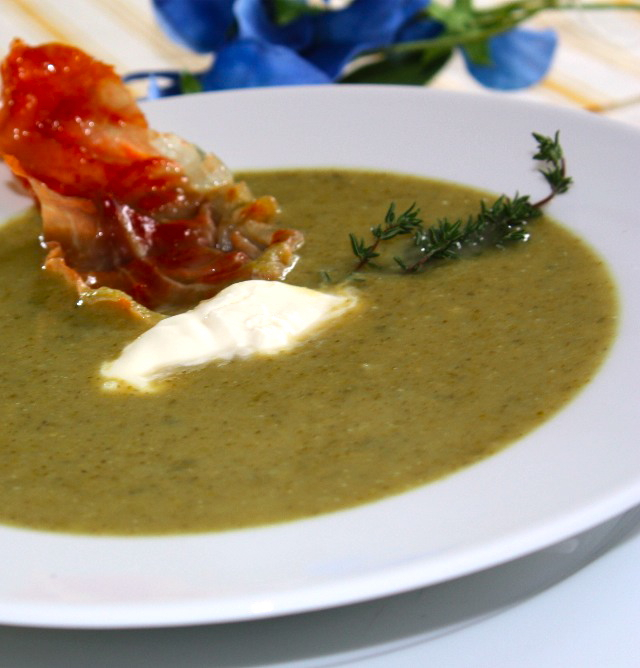 Beautiful and rich soup! I like roasted brussel sprouts as the caramelization is a nice flavor. May try this recipe with roasted ones to see how the smokiness is.